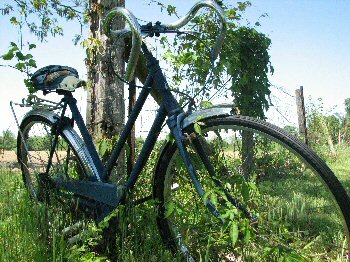 At 237 miles, the Katy Trail is a formidable distance to tackle. Yet, a few hearty souls have ridden the entire trail in a single day. And no less amazing, some hikers have covered the entire trail on foot. Some of these treks were accomplished before the opening of the St Charles to Machens section, when the trail was 225 miles long. Whether the distance covered is 225 miles or 237 miles, it's an incredible amount to tackle in one stretch. BikeKatyTrail does not recommend that you attempt either feat, at least not without a substantial amount of training and planning. But we do want to acknowledge those who have done a single-day ride or walked/ran the entire distance. Congratulations on your accomplishment! Michael's bike: Trek Crockett with Teravail Lickskillets 32mm w/ tubes, 50/55 psi. We encountered a couple issues along the trail - one of our riders, Don Daly (riding a Foundry Valmont with Clement Xplor Ush 32 mm tubeless with 55 psi front/60 psi rear), crashed around mile 14 on the trail and had to quit around 165-mile mark due to a knee injury. Another rider, Michael Allison, had to convert to single speed when his cable snapped, which affected our elapsed time. Kelly Skinner supported us and provided great support at our five pre-determined rest stops. These four riders conquered the trail together, as a group. Tom's bike: 2015 Raleigh RXC with Clement Crusade PDX 33x700c tires with an added bonus of a Bell 700 Memory Foam Seat Cover with Comfort Channel. Andy set the fastest known time for riding Clinton to Machens. See Andy's ride report for great pictures and full details of this epic ride. Bike: Garneau Gennix R1 race bike with 26front and 28rear tires, tubeless at about 80 psi. Dr Dixon rode Clinton to Machens. He was supported by Jason Wilson & Edward T Boys, who witnessed the event start to finish. The wind was out of the south/southeast- therefore this was not a wind aided ride. Bike: Serotta road bike with Schwable Marathon (700x28) tires pumped to about 100 psig. This is the record fastest known time for completing the Clinton-to-St Charles ride. Darin's feat is discussed in more detail in this forum thread. Bike: 2014 Specialized Crux Comp Carbon with Panaracer T-Serve Protex 32mm tires. It was actually a group of 5 of us that started together everyone finished separately by the end of the day. 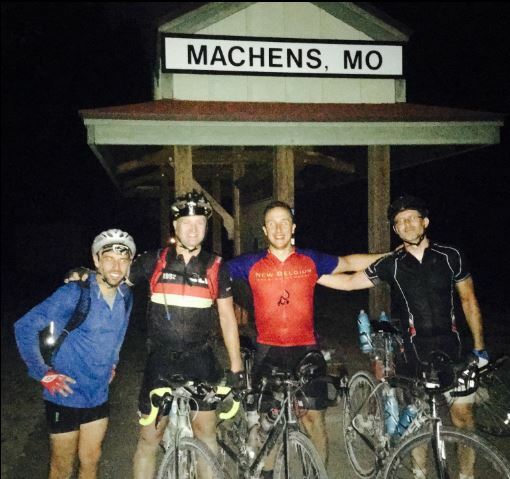 We did it June 23, 2012 a couple of weeks after finishing the Dirty Kanza 200. We only did the 227 mile version because we didn't realize it went to Machens. We knew it went to St. Charles and our support guy was familiar with the spot behind the casino there. Support crew stops about every 30 miles. Nearly perfect day with hardly any wind and some overcast sky for quite a bit of the day. Trail was in excellent condition with zero trees down and no obstacles to overcome. Trail was packed tight, no water spots and only a few ruts. Truly a day to remember. I want to go back with my wife and our tandem to enjoy the trail over a few days instead of just one next time. I finished through flash flood conditions (it rained 90 percent of the day) and yes, on my road bike and skinny racing tires...but it was all for a good cause, to raise money and awareness for breast cancer research, as my wife is a survivor. What I had trained for and planned to take 14 hours or less, due to the horrid trail conditions, took more than 16 hours. It was like riding through deep, wet sand in many parts and frequent deadfall slowed me down as well. What a ride, and what an experience! A friend rode the final 40 miles with me. PBS did a nice piece on the ride in support of the cause. If I do it again, will do it with somebody else the entire way and on a DRY day!!! An impressive 8-day run/hike of the whole trail; see their blog and Strava links. Two men and a baby jogger cross Missouri, from the Kansas state line to the Gateway Arch. Matt ran the entire distance, while David covered 250 miles. 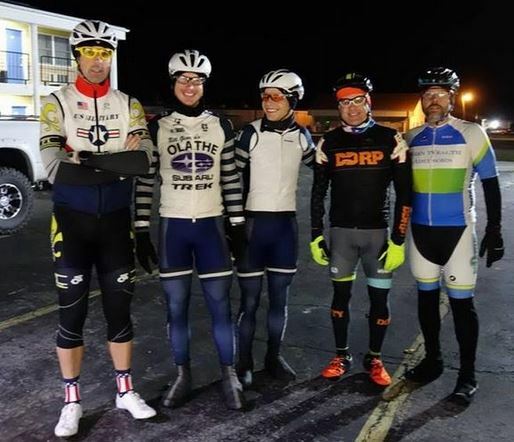 See the Forum post about their cross-Missouri run. Not only did Doug hike the whole trail from Clinton to St Charles - he continued on to Machens (before it was a finished part of the trail)!